When I was a teenager, I used to spend hours reading through my mother’s cookbooks. (OK, I still do that. When I’m over at my parents’ house my mom and I will curl up on the couch with a pile of cookbooks between us. My husband thinks we are weird.) I liked the ones with gorgeous photos (The Best of Gourmet: 1987 ), or glimpses of my mom’s childhood (Better Homes and Gardens Junior Cook Book ) but my favorite reading cookbook was hands down The Silver Palate Good Times Cookbook . Its detailed drawings, urbane quotations, and side snippets about canapés and life in New York City added up to glimpses of a glamorous life where people dined at Le Cirque, dug clams in the Hamptons and ate shad roe at catered parties. Years later, I moved to New York, and although the Silver Palate was long gone (save for a somewhat sad line of raspberry vinegar and hot fudge sauce most readily available in the food section of Filene’s Bargain Basement), I was eager to sample that glamorous New York. Sadly, I found I did not like Shad Roe, I knew nobody willing to share their grand Hamptons house, and my apartment was far too small for the type of party that merited catering. I did eat at Le Cirque though – it was mildly disappointing – my duck was overcooked. Chicken Marbella may be THE classic Silver Palate recipe. 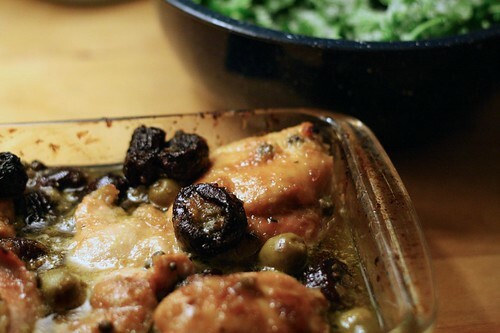 Chicken pieces are marinated (in a lot of garlic, olive oil and capers, of course) with olives and prunes, and then braised in white wine (a nice Chardonnay – is that not the quintessential drink of the 80’s?) The thing is, although the flavors are BIG and BOLD and not really trendy (where is the miso?) it’s a classic for a reason. Despite how weird the combination sounds, Chicken Marbella is delicious – it hits the right balance between salty, sweet and tart. And it’s a total breeze to make as well. I usually don’t make this on a weeknight, since it has to cook for 40 minutes, but there’s no preparation time – it’s all done the night before (which also makes this a great dish for dinner parties.) 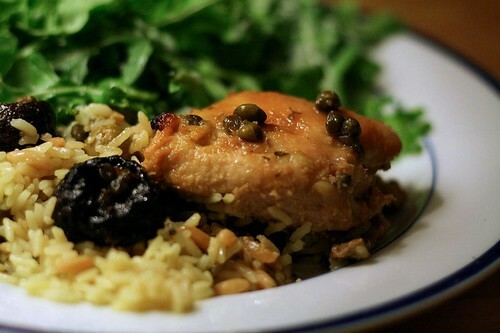 The night before you want to cook the Chicken Marbella (or the morning of – it really doesn’t matter), combine olive oil, vinegar, oregano, garlic, capers and add in the chicken to marinate. 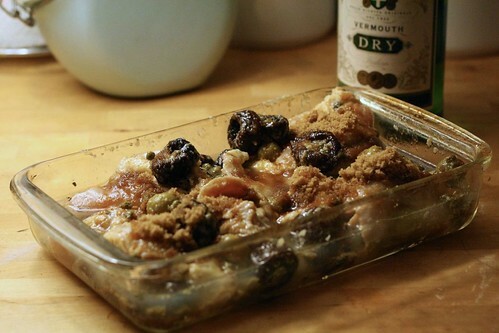 When you’re ready to cook, preheat the oven to 350, throw the chicken and the marinade, into a baking dish, top with brown sugar and add white wine or vermouth. We rarely drink white wine in the winter in our house, and I hate to open a bottle just for cooking. When I’m faced with a recipe that calls for white wine and I don’t have a bottle open already, I use white vermouth instead – it stores longer than wine, adds a nice herbal note, and is relatively inexpensive. Plus, I always have the makings for a martini in the house. I would not, however, recommend substituting red vermouth for red wine, as red vermouth is significantly sweeter than dry red wine. Bake for 40 minutes. At this point your entire kitchen will smell like Chicken Marbella. That’s a good thing. The brown sugar melts and forms a lovely crust on the top of the chicken which removes any need for browning before the braise. The prunes plump up and take on a tang from the vinegar and the wine. I like to serve this over something that will soak up the juices. Couscous is a good option, but my favorite is rice pilaf. When the chicken comes out of the oven, I arrange it on a platter on top of the rice, then pour over all the juices. I usually serve it with a light green salad – bitter greens are particularly good to cut through the richness of the chicken. Chicken Marbella can be great served at room temperature, and travels beautifully for lunch the next day. A little glamour can really brighten up the workday. 1¼ lbs boneless skinless chicken thighs, trimmed of large visible pieces of fat. Mix all the ingredients for the marinade in a bowl or large Ziploc bag. Add the chicken and toss to coat. Marinate overnight or at least eight hours. When you want to prepare the chicken, preheat the oven to 350 degrees. Pour the chicken and the marinade, with all its components into an ovenproof baking dish. Sprinkle the brown sugar thickly over the top of each piece of chicken. Add wine, being careful not to disturb the brown sugar. Bake 40 minutes or until chicken juices run clear when pricked with a fork. Remove chicken to a platter with some rice pilaf or another starch, and pour remaining juices over the top. 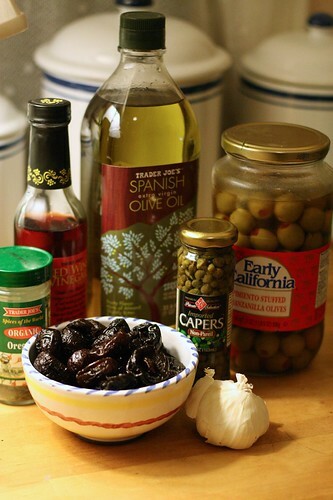 Serve with a simple green salad, making sure each portion has some chicken, some prunes and some olives. Oh i just love this recipe! I’ve had it before and it’s so tasty! I love this dish! Here’s something you can try if you are afraid of prunes, use dried apricots instead or in addition. It’s equally as delicious. I had this dish at The Silver Palate years ago and loved it. Was thrilled to reconnect with it!! Thanks!! My mom lived by the Silver Palette cookbook too, and has made many a dinner of Chicken Marbella. It’s so yummy! I just wanted to add that my mother also made this recipe, and after I went vegetarian (for about 5 years, I’ve reformed now) it was the one meat dish I missed and craved (other than crab). I still love it and make it frequently. How many people does you chicken marbella recipe (March 6, 2009) serve? I am considering using it for 8 dinner guests this coming weekend, but have no idea how many people your recipe serves. 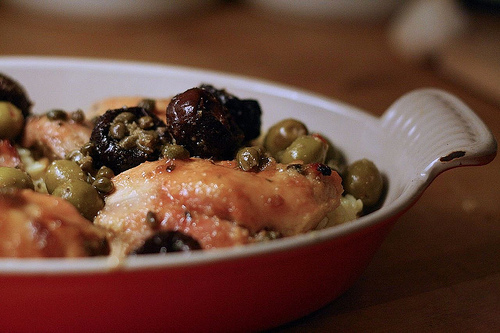 I adore this Chicken Marbella recipe and make it all the time. It’s such a simple and tasty recipe, and it’s always a crowd-pleaser. I also love your description of glamorous ’80s food, and of the Silver Palate cookbooks and store, which also loomed large as I was learning to cook and thoughout my cooking life. I love this recipe. Someone brought it to me after my daughter was born and it is now something I cook for new mama’s because they can eat it cold, warm or however and it is a nice change up from the typical lasagne people get! Thanks for pointing out this was “adapted” (other sites don’t). The real recipe calls for 1/4 cup oregano and a whole head of garlic chopped into a lovely/flavory paste. I strongly encourage people to seek out a used copy of the 25th anniversary Silver Palate Cookbook. It’s awesome, and the real Chicken Marbella — the one and only — is in there. What salad did you serve with chicken marabela? Kay – I usually stick pretty simple – a nice herb and/or green salad with a simple, acidic vinaigrette. The Chicken Marbella is so rich and flavorful that you run the risk of palate fatigue.